These will include craft and art activities related to our wonderful exhibition and collection! Join professional storyteller Pyn Stockman and musician Kate Luxmoore for a lively interactive performance. Discover some of the stories that Shakespeare would have listened to as a boy; the stories that inspired him. There will the opportunity to get involved and share ideas on how you might turn these and other stories into performances just like Shakespeare did. The session will be followed by an Art Cart craft workshop where you will get the chance to make some of the characters you heard about in the stories. 25 May: Elmer Day and all things elephanty! Running in conjunction with the library. 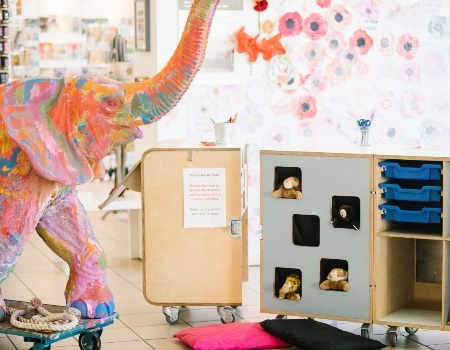 Join us for storytelling, painting the giant elephants and Elmer crafts! Suitable for the whole family. Please note the new earlier finish time. Cost: Free, drop in and join in.